The recent oil downturn is the perfect example of why Exxon is a better dividend stock than ConocoPhillips. Oil has fallen over 20% from its recent highs. That puts the key global commodity soundly in bear market territory. The swiftness of this price move is a potent reminder of just how volatile oil can be. 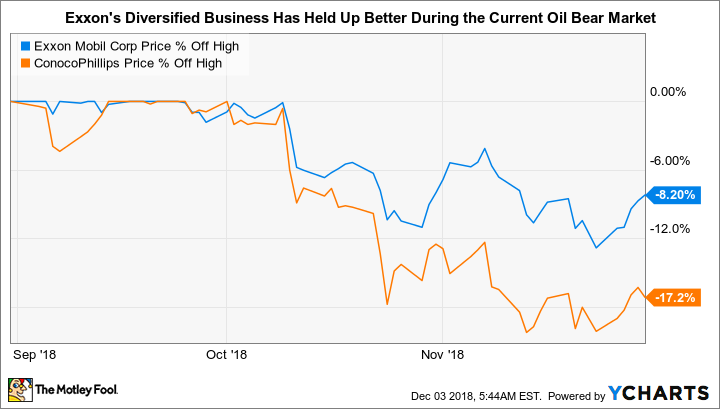 It's also a reminder of why dividend investors should prefer integrated oil giant ExxonMobil Corporation (NYSE:XOM) over ConocoPhillips (NYSE:COP). 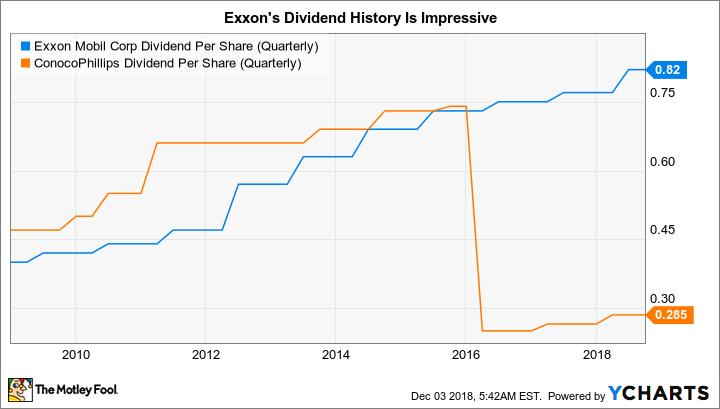 Here's what you need to know to understand why Exxon is a better dividend stock than ConocoPhillips. Exxon is one of the largest and most conservative integrated energy companies in the world. The term "integrated" is key here, because it means Exxon's business spans from the upstream drilling space to the downstream refining and chemicals sector. Having exposure to both the upstream and downstream provides important diversification and balance to the portfolio. This is because oil is a key input on the chemical and refining side, meaning low oil prices are a benefit to this piece of Exxon's operation. To be fair, oil is a much bigger driver of the top and bottom lines, but the benefit of low oil prices in the downstream portion of the business can help to soften the blow of energy downturns. The best example of this is 2015, when low oil prices left the company's drilling business with a 75% profit decline. However, the low oil prices that hit that side of the business led profits in the downstream operation to more than double, leaving Exxon with an overall earnings decline of 50%. While that's still bad, it's far better than 75%. Interestingly, the benefit of having exposure across the value chain showed up more recently, too, when oil prices were still relatively high. During the third-quarter 2018 conference call, the company noted that, "We successfully leveraged our midstream logistics capacity to capture significant value by moving advantaged crudes from the Permian and Western Canada to our manufacturing facilities." These regions are facing transportation bottlenecks that have kept the price of oil and gas from those areas low relative to global prices. The impact of the company's integrated model was notable, with Exxon estimating that its ability to take advantage of the lower prices in the Permian and Canada improved downstream profits by $280 million year over year. Owning assets across the industry was key to taking advantage of this opportunity. Add in Exxon's conservative finances (debt makes up less than 10% of the capital structure) and long-term focus, and the oil giant has a resilient business that's, basically, built to handle oil price volatility. That's how it has managed to increase its dividend for 36 consecutive years, including through the deep oil downturn that started in mid-2014, a feat none of its peers can match. Exxon's level of diversification is pretty much the exact opposite of ConocoPhillips, which is completely focused on the upstream side of the business. Being solely exposed to drilling was the specific goal of the company's 2012 spin off of Phillips 66, which took all of ConocoPhillips' downstream business with it during the breakup. To be fair, there's nothing inherently wrong with ConocoPhillips' decision to be a pure-play oil and gas driller. But the business shift changes the equation in a big way for dividend investors because the top and bottom lines are now entirely reliant on volatile energy prices. Unlike Exxon, there's no counterbalance from a downstream business. The impact of the focused drilling model was on clear display in 2016, when ConocoPhillips cut its dividend 66% because of low oil prices. Although the recent oil price drop probably won't result in a dividend cut, investors trying to live off of their dividends can't simply dismiss the possibility. In fact, the risk posed by ConocoPhillips' drilling focus is a big part of the reason the current oil bear market pushed its shares down 17% compared to just 8% for Exxon. That's a short-term gyration, of course, but one that highlights the very real difference in these two energy companies' business models. If you are relying on the dividends from your portfolio to pay the bills, Exxon's more balanced approach is by far the better choice. If you are a dividend investor, you have to think about the companies you own in a slightly different way. Dividends that get cut during bad times, which is probably right when you will need that income the most, aren't desirable. ConocoPhillips is a perfectly fine way to play rising oil prices, but if a consistent income stream is the driving force of your investment approach, Exxon's diversified business is simply the better option.